Watchet is a harbour town, civil parish and electoral ward in the English county of Somerset, with a population of 3,785. It is situated 15 miles (24 km) west of Bridgwater, 15 miles (24 km) north-west of Taunton, and 9 miles (14 km) east of Minehead. The town lies at the mouth of the Washford River on Bridgwater Bay, part of the Bristol Channel, and on the edge of Exmoor National Park. 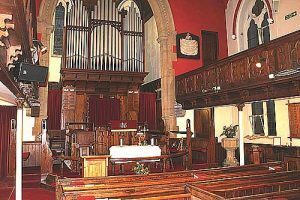 The Catholic congregation of Watchet are guests of the Methodist community and share their chapel in Harbour Road. A Vigil Mass is usually said every Saturday evening at 6.30 pm. Please check the Bulletin for any alterations. Land was acquired in Harbour Road and the Church, which included the first non -denominational Day School, was opened on Easter Tuesday, 2nd April 1872. Former Wesleyan Chapel built in 1871. Early English style, random coursed red sandstone with hamstone ashlar dressings to windows, porch and buttresses. High coped gable, pitched slate roof with finials, 1½ storeys. East front divided into three bays by full height angle buttresses, centre bay breaks slightly forward. Two-light lancet windows with tracery and hood moulds to side bays. One large 5-light central window with geometrical tracery. Gabled porch approached up flight of stone steps. Cusped arched opening. Side elevations divided into four bays, 2 stage buttresses, four 2-light windows with geometrical tracery. Projecting section at west end with hipped slate roof. Inside the Church it is very beautiful with dark shining wood and red carpet. Of much interest is the Baptismal bowl which was carved from a large lump of Watchet alabaster composing variegated tints, and which was presented to the Church in 1931 by Mr J J Moon of Battleton, Dulverton. It rests on four short and slightly carved legs linking it with a square plinth. The inscription reads “Watchet Wesleyan Church 1931 – Suffer little children to come unto me and forbid them not”. The worship area in the Church was partitioned in 1999 in order to create an attractive entrance foyer, and in 2002 a lift was installed to make the Church accessible to those who are less able.